Tires and cars have had an important relationship ever since the first auto rolled onto a dusty, haphazard road. But what if tires could play a more integrated role in vehicle design? 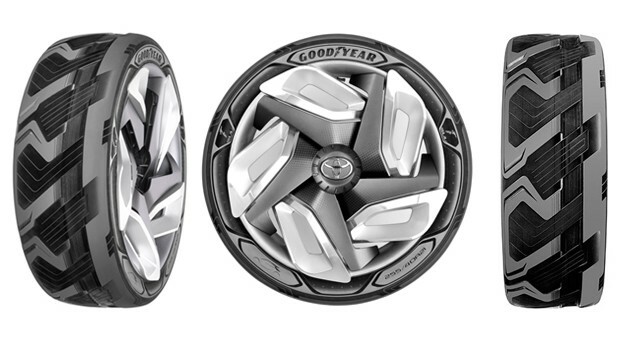 In a debut that caught many by surprise, Goodyear unveiled a new tire concept at the 2015 Geneva Autoshow. Called the BH03, the futuristic tire concept imagines how an auto’s wheels could generate electricity that would then power a car. According to Goodyear’s engineers, BH03 would harness the heat created by vibrations, road friction and the sun to generate power. To realize these spectacular properties the BH03 would have a wrap of thermos-reactive, piezoelectric material underneath its outer shell. As heat penetrates the first layer of the tire the thermos-reactive material beneath would begin producing electricity. While there’s no timetable for when the BH03 will hit the road, if it ever does, it’s easy to imagine how helpful this tire design could be for electric and hybrid cars. With range-phobia preventing greater adoption of fuel-efficient car designs, a fleet of BH03 tires could be a way to push EV ranges even further. Although, I wonder what the magic number is for making range a non-issue—500, 800, 1000 miles?